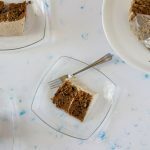 this chai tea latte cake with kahlua buttercream pairs typical masala chai spices (cardamom, ginger, cinnamon, cloves, pepper) with smooth black tea and a hint of coffee-flavored kahlua. i spent a lot of time during my last year of college at one of my friend’s apartments. it was much closer to campus than my places were (i lived in 3 different houses over the course of 9 months hahah), and her free parking was a nice perk (gotta save that money for trips and food). she was a notorious homebody, but since she typically took lead on our painful computer science classes (dw, i did more legwork on our business classes), we’d work on her couch instead of on campus/elsewhere. did i mention that she used to feed me cookies and masala chai all the time? purely coincidental that her birthday was last week, though it makes it feel like the right time to post this chai tea latte cake. chai = tea. plain tea. however, masala chai is the spiced tea that americans seem to call chai, and that’s what we’re dealing with here. i’ve made a spiced cake with tea, and paired it with kahlua buttercream. i can assure you that we did not have kahlua in our chai ever, but i got in the questionable habit of spiking oreo mcflurries with kahlua that fall, and in the spirit of making a cake with the tastes from that time, thought that a chai tea latte cake with kahlua buttercream would be fantastic. the cake (essentially this version from pastry affair, though i added spices to make it a masala chai cake vs a black tea cake) is on the denser side, which is typical of cakes i post here. 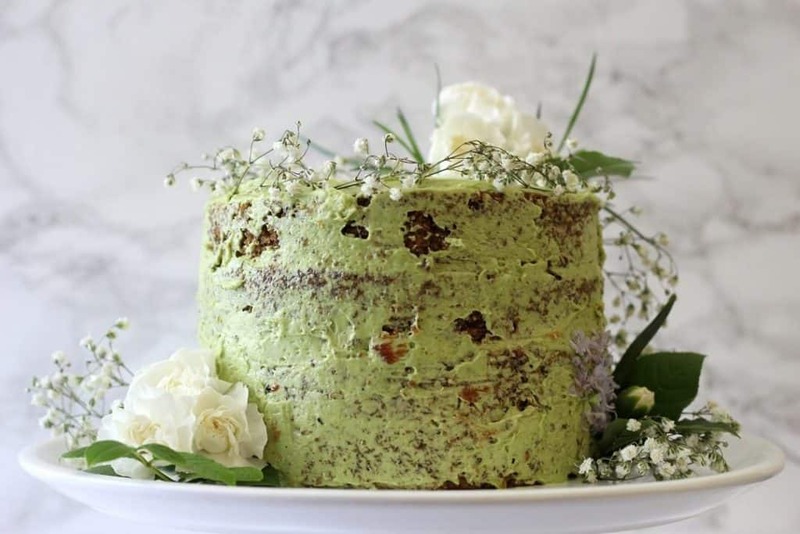 i love chinese baked goods except in the cake arena, as i always prefer western style cakes instead of the too light, it’s more air than cake style of cake that asians make. there’s plenty of tea flavor without it ever veering into bitter territory, with a hint of spice. the tea leaves add a bit of texture; promise that it’s not too strange, especially since they’re softened! and if you don’t want to listen, then you’re fine steeping the tea for a little longer before straining out the leaves. 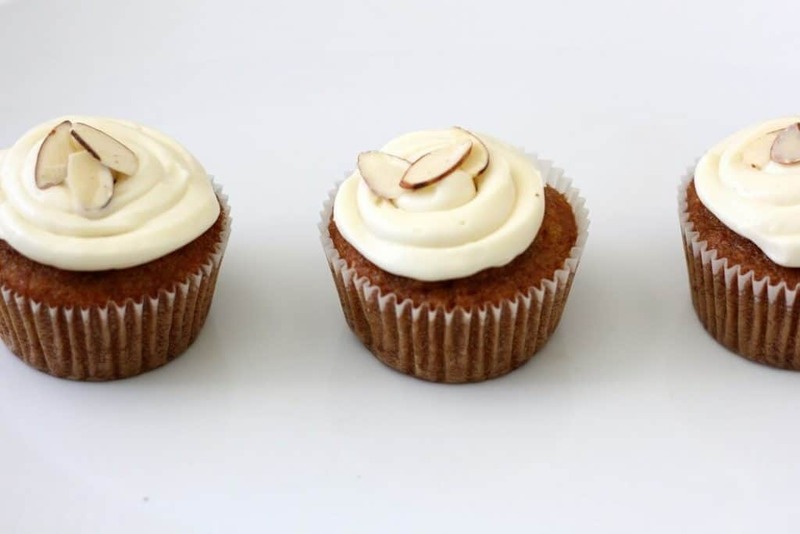 the buttercream is all silky smooth with a touch of kahlua, perfect with all that spice and tea flavored cake. 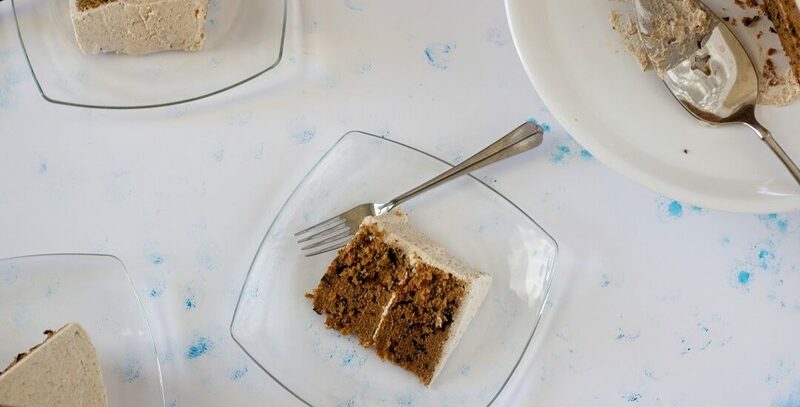 This chai tea latte cake has a hint of spice along with the milky black tea flavor, and is topped with a Kahlua-scented buttercream! Warm the milk until almost boiling on the stove or in the microwave. Stir in the tea, then cool. In a large bowl, cream together the butter and sugar until light and fluffy. Add the eggs one at a time, beating well after each addition. Beat in the oil and vanilla . Gradually add in the flour, baking powder, baking soda, salt and spices. Stir in the milk (tea leaves and all), mixing until smooth. The batter will seem pretty thin and runny. Transfer batter to 2 greased and floured 6" round cake pans and bake at 350F for 35-40 minutes, or until a toothpick inserted into the center comes out with a few crumbs attached. Cool completely before frosting. In the heatproof bowl set over a pan of simmering water, combine egg whites and sugar. Cook, whisking constantly, until sugar has dissolved and mixture is warm to the touch. Attach the bowl to the mixer fitted with the whisk attachment. Beat until it holds stiff (but not dry) peaks, fluffy and cooled. Switch to the paddle attachment. Add butter several tablespoons at a time, beating well after each addition. Beat in the vanilla and Kahlua until smooth. 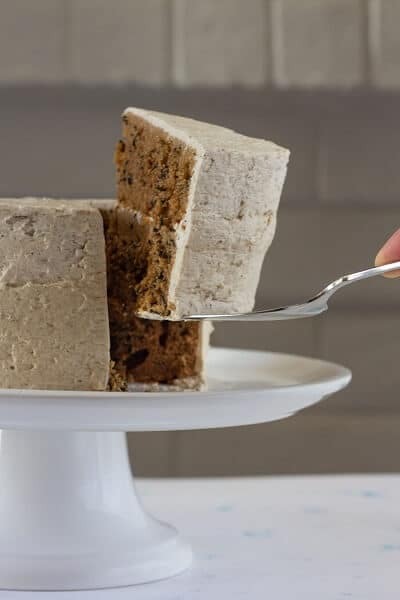 Place a dab of buttercream in the center of a cake stand/serving plate, then place one cake layer (flat side up) over the buttercream and press it down to help the cake stick to the buttercream and the plate. Spread a thin layer of the buttercream (I like to keep this layer thin so that I ensure I have plenty to ice the outside of the cake) on top of the cake. Add the other cake, bottom up, so that you have a flat top. Crumb coat the cake with the buttercream, and refrigerate the cake for 10-15 minutes so that the buttercream can set up. Add the rest of the buttercream and use it to frost the cake more thickly. Cake recipe from Pastry Affair, buttercream from Martha Stewart. Use a strong black tea here (think Assam or English breakfast tea). If you're a little weary of the tea leaves: they're pretty tame, I promise. They add some chew but that's all. If you really don't want tea leaves in your cake, steap the tea in the milk for 30 minutes, then discard the tea leaves. You can use one 9" round cake pan (bake at 350F for 30-40 min) or make cupcakes (bake at 350F for 18-22 min) instead of using two 6" round cake pans. The Kahlua is pretty subtle here; if you want it more prominent/boozy, feel free to poke the cake all over with a toothpick, and drizzle 1-2 T Kahlua over each cake layer before you layer and frost the cake. There's a pretty minimal amount of frosting here; feel free to make 1.5 (or even 2) times the amount here if you want a higher frosting to cake ratio. Heather, this looks and sounds so amazing! I actually enjoy tea-flavored baked goods more than many teas. This sounds perfect! I would have never ever thought of pairing chai and kahlua together!! Two of my all time favorite drinks in one stunning cake!! Mmm, you know how to pair foods really well! Oh man, I know those partnerships in classes, hehe. 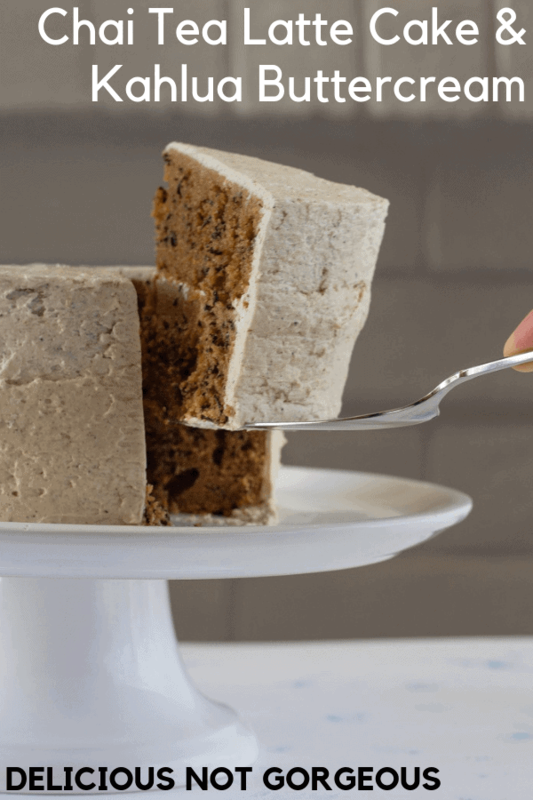 The chai tea latte cake looks delicious! Oh my goodness, the frosting is so evenly spread out! I like that you have a hint of different flavorings going on. Thanks for sharing this recipe!